President Muhammadu Buhari has returned to Abuja after participating at the “One Planet” summit in Paris, France. 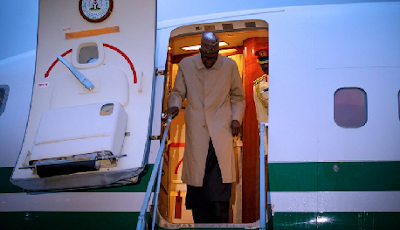 The president’s aircraft landed at the Nnamdi Azikiwe International Airport (NAIA), Abuja, this evening and was received by senior government officials including his Chief of Staff, Abba Kyari, and the Minister of the Federal Capital Territory, Musa Bello. While in Paris, President Buhari had appealed to the international community to support Nigeria’s commitment to reduce the negative effects of climate change. Mr. Buhari told participants that Nigeria could not implement its Nationally Determined Contributions without adequate financial, technical and capacity building support from developed nations.